Green Glue Noise proofing Compound is a unique damping product that is ideal for new construction and renovation projects. It is the most popular and cost-effective soundproofing material on the market. The compound's unique properties act as a damping material to dissipate the vibrations caused by sound waves as they travel through ceilings, walls and floors. 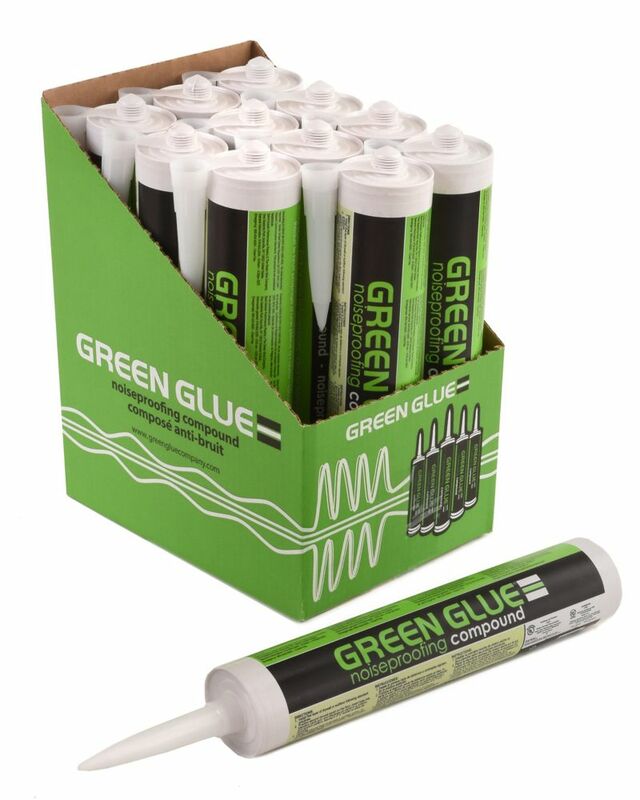 Green Glue Noise proofing Compound is non-hazardous, low VOC's, environmentally-responsible, and has practically no odour. Ideal for new construction and renovation projects. CGC and SYNKO Ready-Mixed Joint Compounds are high quality drying-type products which are used for taping, filling and finishing joints, trims and surfaces of gypsum board. These vinyl-based formulations are specially premixed to a creamy, smooth consistency and are ready to use right from the container. They are easy to apply and are available for hand or machine-tool applications. Protect wet joints and protect from freezing. Choose CGC and SYNKO products for professional results. CGC and SYNKO Ready-Mixed Joint Compounds are high quality drying-type products which are used for taping, filling and finishing joints, trims and surfaces of gypsum board. These vinyl-based formulations are specially premixed to a creamy, smooth consistency and are ready to use right from the container. They are easy to apply and are available for hand or machine-tool applications. Protect wet joints and product from freezing. Choose CGC and SYNKO products for professional results. CGC and SYNKO premium setting type compounds are the professional's choice of compounds for interior gypsum panels and exterior gypsum ceiling boards. CGC's chemically setting compounds rapidly harden (approx. 90 minutes, 45 minutes, 20 minutes) and have low shrinkage allowing for same day joint finishing. These products feature exceptional bond strength (virtually unaffected by humidity) and are ideal for heavy fills (shrinkage crack resistance). In addition, CGC and SYNKO setting-type compounds can be used for filling voids in interior concrete ceilings and above-grade concrete surfaces. CGC and SYNKO premium setting type compounds should be your choice for a professional finish. SYNKO<sup></sup> CLASSIC ALL PURPOSE Drywall Compound is a high performance joint compound that is excellent for embedding tape, filling and finishing gypsum panel joints. It's unique formulation has superior working qualities, good open time, and low shrinkage that results in a smooth and durable finish. SYNKO<sup></sup> CLASSIC ALL PURPOSE Drywall Compound can also be used for fasteners, bead, trim and skim coating. Noise proofing Compound Green Glue Noise proofing Compound is a unique damping product that is ideal for new construction and renovation projects. It is the most popular and cost-effective soundproofing material on the market. The compound's unique properties act as a damping material to dissipate the vibrations caused by sound waves as they travel through ceilings, walls and floors.